Justification and righteousness was always by faith even from the beginning and through the Old Testament (OT) and the Old Covenant (OC). A good example of this is Abraham who was declared righteous by faith, Rahab and Ruth who were grafted into the commonwealth of Israel because they believed. Romans 3:20 says no-one will be declared righteous in His sight by observing the law. Not before, not now or ever. NOTE: The Israelites were born naturally as God’s people, the nation through whom God chose to make Himself known and through whom His son Jesus would come. That however, did not make them all God’s spiritual people i.e. those who would be saved, who would inherit all things and live eternally with Him. The same is true today for those who may be religious Christians but are not born again by the Spirit of God. Being a ‘Christian’ does not mean we are saved, for salvation is by faith from the beginning to the end. All must be saved by faith in Christ, irrespective of our nationality or religious identity. Abraham had two sons and similarly, God has two peoples. 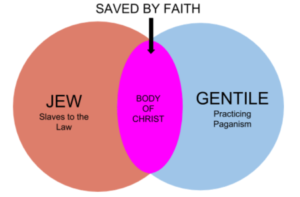 Question: What is the difference between Jew and Gentile as pertaining salvation? Before Christ there was a separation where the Jews were God’s people and the Gentiles not but even this was nothing more than a foreshadow of what was to come. Israel was saved from Egypt by the blood of the lamb, they were baptised in the Red Sea and in the cloud, they were led, protected and provided for through the wilderness. They received the word of God and the promises of God. On the other hand the Gentiles were a heathen people who were the enemy of God and His people the Jews. In those days God destroyed the Gentiles and drove them out the land ahead of Israel but since Christ this has all changed. The separation now is between those who have been born of the Spirit through faith in Jesus and those who were not. The wall of partition between Jew and Gentile has been torn down and now we are one in Christ opposed and persecuted by those who are not in Christ be them Jew or Gentile. Question: So what is the name of this united people? This one man whom Christ has brought together through His blood is called Israel (or Spiritual Israel for clarity) We are, “…a holy nation, His own special people… who once were not a people but are now the people of God…” 1 Peter 2:9-10 God’s children does not include unbelieving Jews. It is however, the believing Jews along with believing Gentiles that the term ‘God’s children’ apply to. 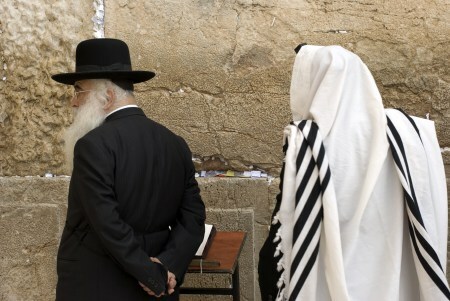 Question: So aren’t the Jews the true descendants of Abraham? Answer: The Jews are the physical descendants of Abraham but the promises were not to those who were only physical descendants but to those who were spiritual descendants, those who are of faith. Romans 9:6 – 8 “For they are not all Israel who are of [natural] Israel,7 nor are they all children because they are the [natural] seed of Abraham;…8 That is, those who are the children of the flesh, these are not the children of God;…” They are of the same nationality as Jesus but are not all God’s children. We who believe, Jew or Gentile, are the true children of God and of Abraham but the unbelieving are not, even if they were born Jewish. Abraham had two sons, one through natural means, the other by God’s power and promise. Similarly God has two peoples, one born as natural descendants of Abraham, the other by God’s power of salvation through Jesus Christ who was the promised seed of Abraham. They are children of Abraham through faith.